Without a doubt, everyone likes empanadas. They are practical, they can be prepared and taken anywhere, they are also bought anywhere and there are always different tastes to try. Each empanada is a world. But something is true: they are not usually low in calories or slimming. Learn all about the calories of empanada in this note. One of the star meals in which to street dishes, fast, easy, transportable and suitable for any type of situation is the empanada. They are consumed throughout the world, in all kinds of formats and variants, but this dough is never missing anywhere with some type of filling and with different ways of cooking. But … have you ever wondered how many calories a simple ham and cheese pie you eat when you’re away from home? Or even the meat pies that you prepare in your home? As well, do not despair: here you will find all the info about it. And also a few tricks to make your empanada lighter. Do you want to know how many calories a meat pie has made in frying? Well, you should know that it is one of the most caloric specimens that exist. Be careful with the amount you eat! For every 100 grams of fried meat pie, you have between 260 and 300 calories. It contributes between 17 and 20 grams of fat, about 20 grams of carbohydrates and between 7 and 8 of proteins. Now are you interested in knowing how many calories a baked meat pie has? This reduces the amount of calories and also fat. But it is still something to be taken into account. You will consume around 230 and 250 calories per 100 grams of baked meat pie. It has between 15 and 17 of fats, about 20 of carbohydrates and 7-8 of proteins. 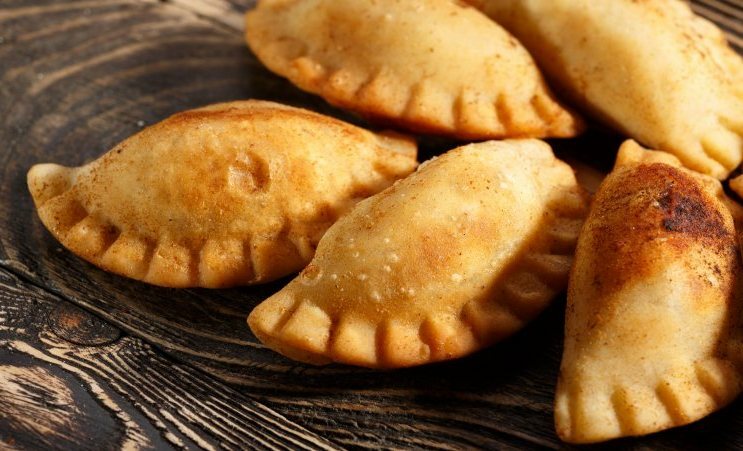 The calories of ham and cheese empanada are moderate, although it always depends a lot on what they are made of, of course. To take into account this info. A pie of ham and cheese made in the oven, about 100 grams, gives you about 200 calories, 22 grams of carbohydrates, 7-8 of protein and 10 of fat. And now you want to know how many calories a cheese pie has that you traditionally eat on the street? Well, attention with this data. If the cheese pie is fried, it can have up to 270 calories. If not, it can reach 200-220, considering the type of cheese it have inside. Round 10-12 grams of fat, 17 of carbohydrates and 8 of protein per 100 grams of product. If you want to know how many calories a humita, corn or maize pie has, keep an eye out for these numbers that you will see below. The amount of calories is greatly reduced, since it has about 180 per 100 grams of product, as long as they are baked. In addition, they provide little fat: no more than 5 per 100. Yes they are richer in carbohydrates, reaching about 25. And about 8 grams represent proteins. If you are looking to reduce the calories of a baked meat pie and other varieties to consume, do not forget to pay attention to these tips, which will help you lower it calories when you prepare them at home. Use integral dough. With this you can make a good difference. While it do not reduce calories, yes carbohydrates and desire in health. A whole dough is much more nutritious than one made with refined flour. Use lean meat. If you want to make meat pies, buy lean ground beef. Or make it grind in front of you to make sure what it has. And then, when you make the filling, do not hesitate to use little oil and many vegetables such as onions, chives, peppers and olives. Use soft cheese. If you like empanadas with cheese, go for one that does not have a lot of fat or calories. Some lean, but with flavor.